Urban Edibles is the project of Catherine Butler. She is passionate about creating sustainable human food systems that honor and respect all life. Catherine received her B.A. in Ecological Agriculture and a Permaculture Design Certificate from New College of California. She has over 25 years of landscape and horticultural experience, beginning with her first studies of Horticulture in her hometown of Richmond, Virginia. 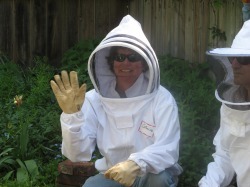 Catherine is a member of the San Francisco Permaculture Guild, the San Francisco Beekeeper's Association, and the San Francisco Urban Agriculture Alliance. Her many adventures in the landscape industry include working as a landscape supervisor in San Francisco, directing sales and marketing for Virginia Berry Farm wholesale nursery, launching her East coast landscape design company Dragonfly Designs, and independently studying medicinal herbs, beekeeping, and greywater systems. She is dedicated to helping communities become more connected to their food and place, and enjoys teaching others about gardening and sustainability.